﻿Kingwood Carpet Cleaning Pros don’t only clean carpets- we also clean your tile and grout! Tile and grout is another service that we specialize in in order to keep your home as clean as possible. Keeping your grout and tiles clean is maybe even more important than keeping your carpets clean, as the mold and bacteria that can grow in your tiles and grout can be very harmful and dangerous to your health. If you have grout and tiles in your kitchen and you spill a bottle of red wine, the red wine will seep into the grout and it will be difficult to get the red color out. If you try to scrub it, you will only be pushing the wine further down into the grout, which makes it harder to clean because you have to reach down much further than the surface. When people spill something that stains their grout, they often try to use a brush to scrub the grout to get it clean. This is a bad idea for a few reasons: first of all, if you scrub too hard, you will be damaging the grout by stripping it away. If you strip your grout, you will have to get it replaced entirely, which will be much more expensive than just hiring a professional to get your grout cleaned for you. 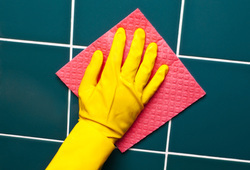 In your bathroom, grout and tiles attract soap scum and can cause black mold, mildew, mold and other bacterias to grow. They will embed themselves in the grout, and thus cause your bathroom to be dirty and hazardous to your health. The whole point of a bathroom is to have a place to get clean, so having a dirty bathroom is counterproductive and will not help you with any cleanliness. Similarly, if you have grout and tiles in your kitchen, you will want to keep them clean because you are cooking and eating in your kitchen. Having dirty tiles and grout will not only make your kitchen look bad to you and your guests, but can cause problems for your health. Kingwood Carpet Cleaning Pros can clean your grout and tile while we clean your carpets, or we can just clean your grout and tile if you do not need any carpet cleaning. Don’t be fooled by the name- we can do it all! Keeping your grout and tiles clean is important, because getting them replaced will be expensive and a nightmare. Having us clean them is easy! We have all of the right tools and equipment, and can make sure that your tiles and grout are clean so that they both look good and serve their best purpose and function.